Flexible Working: Is It Right for Your Business? As working from any location suddenly appears more realistic through new technology, flexible working has become an increasingly popular idea. As an employer, it is tempting to offer this as a benefit, because it appears to be the right thing to do for your employees' wellbeing, many of your talent competitors have embraced it and the technology to support its implementation now exists. However, what’s now clear is that flexible working isn’t always right for every business or isn’t right for each employee. Is Flexible Working Right for Employees? The general consensus is that flexible working arrangements are a major employee benefit and allow people to juggle their work and life responsibilities more effectively. In practice, however, the reality can often be quite different. The first issue is that many people actually like having a clear divide between their work and personal life. Going to work every day at regular hours provides routine and allows other events to be planned around this. This said, knowing the flexibility exists to collect the children early one day due to sickness, or to work from home for a couple of days due to an unexpected personal situation, is nearly always a positive. If routine isn’t an issue, then the other two big issues can be personal performance and isolation. Whilst work output may be consistent or even higher, if an employee spends more time out of the office than in it, there is the risk of going unrecognised. With achievements undervalued and progression opportunities being missed, isolation is a fairly obvious risk. The interaction within a workplace often creates friendships and inspires social events due to shared interests. To an extent this can be replaced remotely but technology isn’t quite at a level where it can substitute the relationships built up in person. There are a few published cases that suggest positive flexible working policies have a substantial effect on business results, and it’s generally agreed that having some form of flexible working arrangement adds to your technology business’ ability to attract top talent. These two points don’t mean you should flip the switch and immediately embrace a flexible workforce. These are just some of the considerations that you should review. This is the most important element to consider because not every role is suited to flexible work. Firstly, the most obvious role type that is suited is one where the individual works alone and doesn’t have to complete any physical work. For example, this could be a Software Tester completing a repetitive test and then sending these results off to be analysed by another party. Yet even in this scenario there could be areas where team interaction is required. This is the most common constraint to flexible work. It is possible to communicate remotely through project management and chat tools such as Trello and Slack but neither of these products, nor their peers, have yet been able to replace one-on-one contact. Too much reliance on these more often than not leads to the death of a cohesive team environment. The only exception here could be gamers, as this group of people are the furthest ahead when it comes to effective online collaboration! Telepresence (participation remotely with the appearance of being present) looks to be the solution to this restriction. It’s in early stages at present, but this video from Facebook gives a good indication to what we can expect. Jobs that require any variety of physical labour are currently impossibly suited to remote work. This doesn’t mean this group of people can’t receive a certain amount of job flexibility, for example, flexible hours but they can’t be completed from home. This could all change in the next few years as telerobotics (people in one place operating machines in another) has a significant amount of research dedicated to it. Management is the last category that isn’t easily suited to flexible working. Unfortunately for Managers, communication is the biggest restrictor for them. Working remotely for a period of time or having varied working hours is likely to massively impact their ability to effectively manage people. 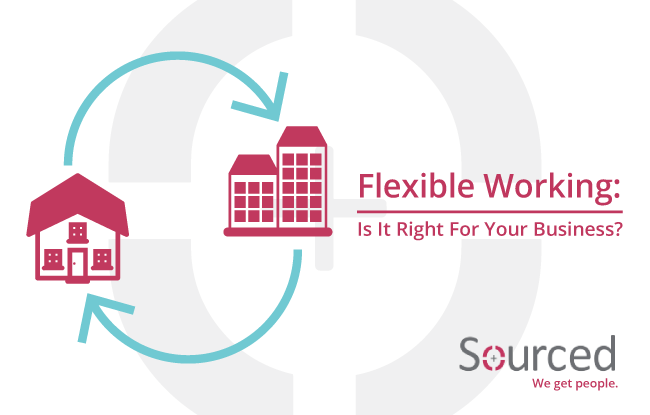 If you’ve made the decision to roll-out a workplace flexibility policy, ensure you’ve carefully thought through how this may apply to all areas of your business. Considerations should include; the roles within your company, your existing company culture, the availability of required technology and also the ability to manage this change. Then, whether it’s during an interview or a conversation with an existing employee, discussions around workplace flexibility often tend to be fraught with emotion. It’s therefore important to approach individual requests on a case by case basis and to ensure that both parties clearly understand what each other is trying to achieve.